If you are interested in joining TLC for this year please fill out the application below and submit it to the Teen Department. Step 4: See you in October for our first TLC meeting of the year! Through involvement with TLC, teens will have community service opportunities, gain leadership experience by creating, marketing and planning events, hear from professional speakers, and learn lifelong skills. 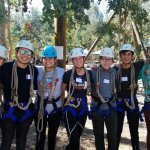 Over the past years, TLC has been involved with, Teen Screen, Like Israel Project, Senior Buddies, Jserve, Good Deeds Day, Senior Buddies, Feeding San Diego, San Diego Food Bank, UCSD Ropes Course, Humane Society, Shabbat San Diego, Friendship Circle, and many more. We envision a society in which teens of all backgrounds are active and visible young leaders in their communities and have the capacity to reach their full potential.